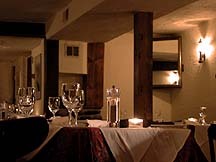 All lovers of Art Déco must at some time go to the resort town of Fasano del Garda, for here is to be found Il Imperiale. This was the home and is now the last resting-place of the writer and adventurer, Gabriele d’Annuncio. To this fantastical estate came many of the artistic and political leaders of the ’20s and ’30s. Now it is a museum, and it is an astonishing confection, at once highly eccentric and strangely disturbing. 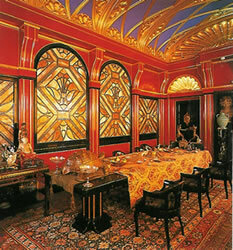 The red and gold dining room of the house, of which an illustration appears below, repels and fascinates in equal measure. This is a destination not to be missed. So you will need some good lodgings. I know just the place – the Grand Hotel Fasano & Villa Principe. The Villa Principe part of this establishment’s name refers to the building on the right of the picture, which was built in the second half of the 19th century as a hunting lodge for the Hapsburgs. 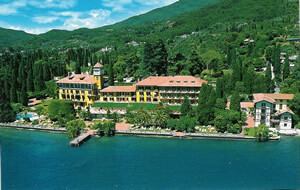 Now the hotel has 80 rooms, and reclines with some dignity on the very edge of the western side of Lake Garda, apparently saved from sliding into the water by its 12,000 square metres of sub-tropical gardens (in which a grand spa will soon be opening). On its landward side is a busy road, but no traffic noise seems to penetrate its gracious corridors and halls. Several of my afternoons were spent pleasantly in these restful public rooms, or on the large terrace overlooking the lake. And, after dinner one evening, there was a real treat. I had noticed earlier in the day a notice about some live music. I had feared that it might mean some nasty noise of the ‘popular’ kind. In fact, it turned out to be two young local fellows, playing the piano and the violin. Remarkably good they were, too – so I sat in the elegant bar for an hour and thoroughly enjoyed their interpretations of Liszt and Cole Porter. Any hotel which provides such entertainment receives a large tick in my book. What, then, of the accommodation? My billet was on the third floor. Room 217 cost 300-340 euros a night, half-board for two, according to season. (You will note that the hotel’s prices are reasonable.) 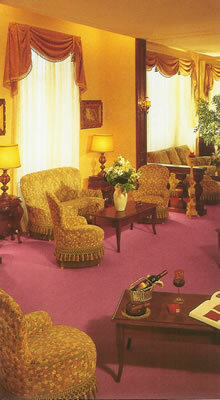 The bedroom was spick and span, with air-conditioning, two easy chairs, a safe and a small lakeside balcony. The bathroom was tiled, quite small and possessed of decent bath towels, but rather inadequate hand towels. Given its lovely views of Lake Garda, this apartment was very good value for money. My half-board arrangement allowed me at dinner to choose any four courses from the menu at Il Fagiamo. The name means ‘ the pheasant house’. It is a terrace under a yellow striped awning, lit with candles and carriage lamps. With its white tablecloths, its vases of dried flowers and its waiters in their grey waistcoats, this is an elegant setting in which to dine. And it is even better if you have a table towards the far end of the room, from where there is a quite magical view of the lake. From my meals here, let me recommend to you the dishes I rated most highly. 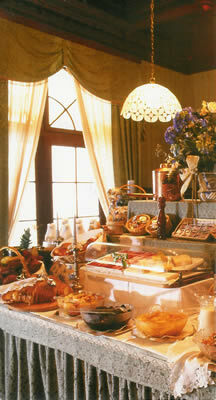 First, the hors d’oeuvres table. From this I helped myself to sliced sweet peppers, grated carrot, Parma ham, slices of rare beef, tuna and aubergine – all good. The pheasant tortelli, was – appropriately, given the restaurant’s name – the star of the show, full of flavour from the accompanying parmesan, cream and black truffle. Two main courses pleased me: beef fillet, simply grilled, and breast of duck, with a honey and rosemary sauce. Of my puddings, one stood head and shoulders above the rest: the millefeuille of pear, chocolate and Chantilly cream – carefully made and quite delicious. 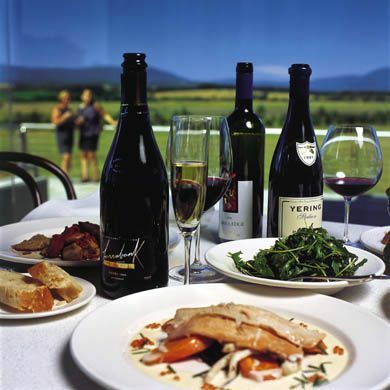 About 90 wines are offered, ranging in price from 17 euros for a Lombardian white to 210 euros for the 1998 Gaja Barbaresco. 1999 Ornellaia is 110 euros. From my own drinking, I would point you to a sauvignon blanc from the Trentino, with lots of grassiness and cat’s pee (Cantina Tramin, 2004 – 21 euros), and a light, fruity red from Tuscany, made from the sangiovese grape (Pater, Frescobaldi, 2003 – 20 euros). I enjoyed my stay at the Grand Hotel Fasano & Villa Principe. Its solid, respectable comfort was just what I needed – as a foil to the enchanting, exotic madness up the hill at Il Imperiale. Corso Zanardelli 190, Fasano del Garda 25083, Gardone Riviera, Italy.